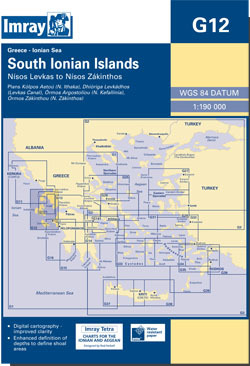 The south Ionian islands from Nsos Levkas to Nsos Zkinthos. Scale: 1 : 188,200. Larger scale plans for Klpos Aetou (N. Ithaki), Dhioriga Levkadhos (Levkas Canal), Ormos Argostoliou (N. Kefallinia), and Ormos Zkinthou (N. Zkinthos).